I am choosing to focus on Emma, my great great grandmother, today, and not her husband William to the same extent. This is because, although I never met her, my grandmother and mother always told me stories about her, what a strong and resourceful woman she was, and how she presided over the family as its matriarch. She is one of a handful of family members whose stories I always wanted to preserve, and about whom I was terribly curious. 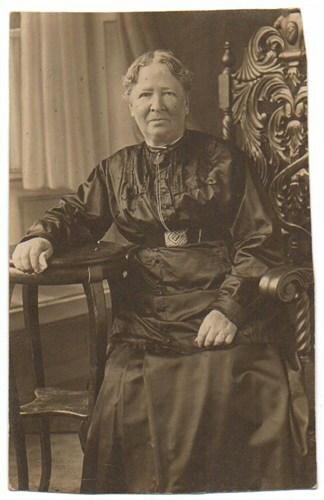 She is one of my favourite ancestors, and I am grateful to her as a genealogist for having given some of her children family surnames as their middle names. This “bread crumb trail” has helped me to identify ancestors in previous generations, which is challenging when you are dealing with common names like "Cook" and "Green". She was also good about having portraits done of herself and her family. Thank you, Emma. It may be that she did not want her family to be forgotten. She did have a family Bible, but I am not aware of its whereabouts. (If you, gentle reader, know anything about it, please let me know). I have interwoven the family stories with the facts in this, the first part of two posts about her and her family. 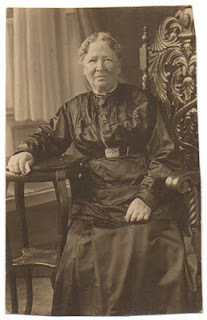 Emma Green, my great great grandmother on my purely maternal line, and the mother of Faith Cook, Herbert Saunders’ wife, was born on June 28, 1849, in Helpringham, Lincolnshire, England. She was the youngest of the eight children of Edward Wilson Green and Elizabeth Newton. Her siblings were James, Ann Newton, Mary, Sarah Anne, Susan (Susanna), Eliza and Edward. Her father’s occupations, according to census and other records, included agricultural labourer and gardener. Emma was literate, and at the age of twelve she was in school according to the 1861 census. She married William Cook, (born in Timberland, Lincolnshire), on January 10, 1871 in Wilton, Yorkshire, at the Church of Wilton in Cleveland, at the age of twenty-one. The 1871 census lists her a “dress maker” and him as a “labourer” in the “iron mines”. (An aside to this story is that when I started sewing my clothes as a teenager, that I was told that I came from a long line of seamstresses, beginning at least with Emma). It is not known why they are both living in Yorkshire at that time, except possibly for work, or whether they met before or after moving there. Their eldest daughter, Clara Matilda, was born December 6, 1871 in Eston, Yorkshire. Of their next two children, Edward William was born in St. Bottolpham, Lincolnshire, January 21, 1875, and Arthur Wilson was born in Bexley Heath in Kent on December 17, 1878. Since their daughters, Lily Elizabeth Newton (b. September 25, 1881) and Martha Annie Wheatly (b. October 13, 1884) were both born in Guisborough, Yorkshire, and the family is living there according to the 1881 census, we cannot assume that the family ever moved out of Yorkshire before then, despite the boys having been born elsewhere. Emma simply could have travelled to have them. Their son Samuel was born in Timberland, Lincolnshire, the birthplace of his father, on September 9, 1886, and their daughter Faith, my great grandmother, in Helpringham, Lincolnshire, Emma’s birthplace, on November 10, 1888. Four of the children were baptized in Timberland between 1886 and 1888: Lily, Martha, Samuel and Faith, which are all indicators that the family was likely living there or nearby at the time. 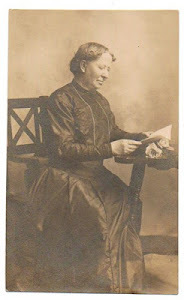 Emma’s parents, who were living in Helpringham, died around that time, Edward Green in 1875, and Elizabeth Newton Green, in May 1888, before the birth of Faith. Emma had a pair of earrings made out of the coins she found in her mother’s pockets after her death. According to family lore, Emma was already struggling with her husband William’s drinking problem in England. She is said to have gone around to all the pubs in the town and persuaded them not to serve her husband. William left for Canada, likely with his brother Elijah the same year, 1888, one year before the rest of the family. It seems that “serial immigration” was a common practice, that is, one of the family members, usually the head, went to the new country first to prepare the way for the others. Emma brought the children with her to Canada the following year, including her infant daughter, Faith, who appears to have been born after the departure of her father. There is a family story about this voyage, which involves Faith developing an infection in one of her arms. It is told that the ship’s doctor wanted to amputate her arm, and Emma would not allow this. She said, “I didn’t call her ‘Faith’ for no reason”. The arm healed, and Faith had no problems with it for the rest of her life.